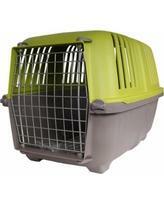 Thanks for looking at our MidWest Spree Plastic Pet Carrier, green 22! Spree Pet Carriers by MidWest Homes for Pets are a fun and fashionable way to travel with your small pet. They"re perfect for cats, small dogs, and other small mammal pets. They have all the amenities you want in a plastic carrier including excellent ventilation, carrying handle, and durability. Spree Pet Carriers come in three bright and fun fashion colors and two sizes, 19" and 22".